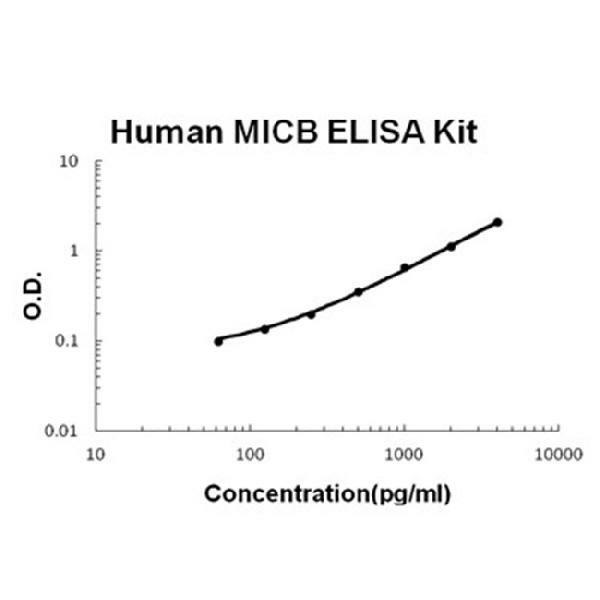 Sandwich High Sensitivity ELISA kit for Quantitative Detection of Human MICB. 96wells/kit, with removable strips. Widely expressed with the exception of the central nervous system where it is absent. Expressed in many, but not all, epithelial tumors of lung, breast, kidney, ovary, prostate and colon. In hepatocellular carcinomas, expressed in tumor cells but not in surrounding non-cancerous tissue. . Cell membrane ; Single-pass type I membrane protein . Binding to human cytomegalovirus glycoprotein UL16 causes sequestration in the endoplasmic reticulum. . Seems to have no role in antigen presentation. Acts as a stress-induced self-antigen that is recognized by gamma delta T cells. Ligand for the KLRK1/NKG2D receptor. Binding to KLRK1 leads to cell lysis. .
MHC class I polypeptide-related sequence B, also called MICB is a protein that in humans is encoded by the MICB gene. The MICB gene is mapped to 6p21.33. This gene encodes a heavily glycosylated protein which is a ligand for the NKG2D type II receptor. Binding of the ligand activates the cytolytic response of natural killer(NK) cells, CD8 alphabeta T cells, and gammadelta T cells which express the receptor. This protein is stress-induced and is similar to MHC class I molecules; however, it does not associate with beta-2-microglobulin or bind peptides. It seems to have no role in antigen presentation. This gene acts as a stress-induced self-antigen that is recognized by gamma delta T cells. It is the ligand for the KLRK1/NKG2D receptor and binds to KLRK1 leads to cell lysis.